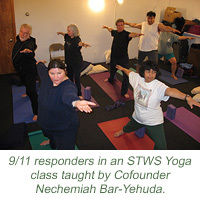 Since 2004, STWS has been providing yoga classes to help the 9/11 community heal. Recently, STWS has expanded to partner with many participating yoga studios in the NY metro and tri-state area to offer classes on a donation basis to a broader community. As a courtesy to the generous studios and teachers who are providing these healing services, we ask you to donate $10 per person, per class. This is a substantial discount from the regular price. If Nechemiah is not available, please leave a message with your contact information. Nechemiah will contact the studios to verify your eligibility. Find a Studio Click on Find a Studio button to locate participating yoga studios near you. The directory is organized alphabetically by state, borough/county, and neighborhood/city. For each studio, you will find the studio address and offerings and links to the studio website for class schedule, class descriptions and home page. If you live in the NY metro area and there are no studios near you, let us know and well try to add one. Or if your yoga studio is interested in participating in our program, please contact us. Please send an email to yoga@stws.org. We continue to expand our program to include more studios in the NY metro area. Please check our website for updates. Participating studios are offering their regularly scheduled yoga classes for the Yoga by Donation program. Please note that Workshops and special classes are not offered at discounted prices. Please check with the studio to confirm that the class you select is eligible for the program and that it is appropriate for your level of yoga practice. • If you are new to yoga or are experiencing health issues, we suggest that you try one of the following classes: basics, open level, gentle, restorative, therapeutics, meditation or pranayama. • If you are already practicing yoga, you may like to try an intermediate or advanced level class. • If you have a special need, many studios offer yoga classes for specific populations, including prenatal and postnatal, family, yoga for people with H.I.V. and yoga for people with M.S. • If you have a medical condition, we suggest that you consult your physician before taking any classes. Some studios offer other classes besides yoga, such as Qigong (or Chi Gong), Pilates, Fitness, Belly Dancing and Dance Yoga. Please check the studio offerings on our website. You can find some of the experiences that people have had from our yoga classes in the following link: Yoga Students Testimonials.